The company has had a great run in recent months. Here is what happened and whether the trend is sustainable. 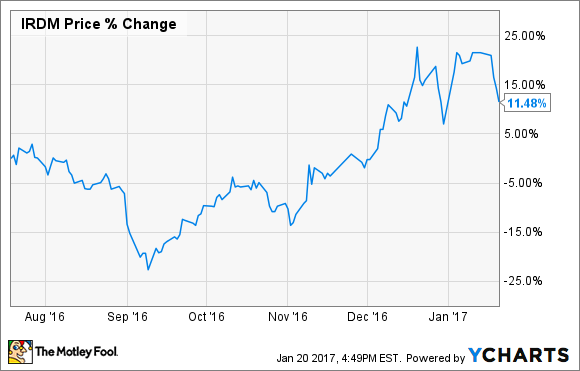 Iridium Communications' (NASDAQ:IRDM) stock rose by as much as 35% in the weeks following the presidential election and is now up about 25% from where it was before the election of Donald Trump. While initial investor exuberance over potential Trump-fueled spending that could benefit the company may have gotten the party started, the real reason for the rise in share prices is more likely that the company's new satellite array is finally launching. Iridium's stock is up roughly 11% over the past six months or so. SpaceX, which is handling the deployment of Iridium's next-generation satellite array, called NEXT, was set back last fall after an explosion during one of its launches. An investigation ensued, causing long delays for SpaceX clients, Iridium included. The cause of the explosion was discovered and mitigated, putting SpaceX launches back in play and Iridium back on the schedule. On Jan. 14, it was announced that the first 10 satellites in the new NEXT array were successfully launched into orbit and will be kept in a temporary orbit and tested over the next few weeks. After that, they will be moved to their final orbit and be put into operation. SpaceX has been contracted for six more liftoffs, which will carry 60 more NEXT satellites into orbit through midyear 2018. What's the big deal with satellites? Iridium is a communications company that makes hay by providing mobile services to government entities and businesses. The company's key differentiator is that it provides that service through a "constellation" of 66 satellites at last count. Because of this network, Iridium's service covers the entire surface of the globe. This advantage puts the company in a unique position to provide mobile service to ships sailing the high seas, aviators navigating the skies, and organizations that require coverage in isolated and hard-to-reach corners of the globe. Traditional mobile companies are making a push for 5G broadband service, the next-gen platform that will power ultra-high-definition video, fast speeds, and the Internet of Things. For Iridium, the NEXT satellite array will support the company's own next-gen broadband service to the whole surface of the globe. The NEXT satellites will support the new CERTUS platform. CERTUS is being touted as a multiplatform mobile service that combines voice, data, and broadcast options into one package. Speeds up to 1.4 mbps will eventually be available, supporting mission-critical communications and machine-to-machine connections that will be minimally disrupted by inclement weather. When complete, NEXT is Iridium's bid to fuel growth in the years to come, as it will have set the bar for competition in the satellite mobile service sector. It will take a year and a half for the new satellite constellation to be finished, barring any further setbacks, which means that the recent stock run-up is more about future hopes than current business results. The hot streak started to cool off in the past week or so. However, Iridium's price-to-earnings ratio based on the next year's earnings estimate is at 16.7. That's not exactly a value, but it's not overpriced, either. Profitability isn't expected to really kick into high gear, though, until NEXT is complete in 2018. The company sees revenue rising to as much as $465 million a year by 2018, up about 8% from the last 12-month period, and profit is expected to expand as costs to deploy the new satellites wind down. Even though Iridium stock has been on a tear, the party may just be getting started. Iridium is just beginning the execution of its next-gen business model, so the full force of that work hasn't yet been realized. This stock is worth keeping an eye on.